You know the road race, Paris-Roubaix? A true spring classic, with a real tough guy reputation? In the 70s it became the subject of a rather fine documentary, 'A Sunday in Hell'. 'Sunday' is a great film in many ways, probably one of the best ever made on road racing. I've only once seen it all the way through, but one sequence stays with me, a few seconds of film capturing a magical combination of effort and achievement. A long shot of a narrow line of riders, stretched to breaking point. A snake of dust kicked up from the dry, muddy cobbles of Northern Belgium. The guys at the back hang on for grim death, working just as hard as the lone rider at the front pushing the pace. They know that, if the elastic snaps, they'll never get back on. Close up of some unknown continental, hands resting on the bars, the look of determination on his face belying the brutal pounding shaking his body. His head is controlling the race, thinking tactically, working the legs. His body is on automatic, coping with the terrible suffering being handed out by this vicious terrain. I was reminded of this moment during my second descent of the day on the Marin Trail. 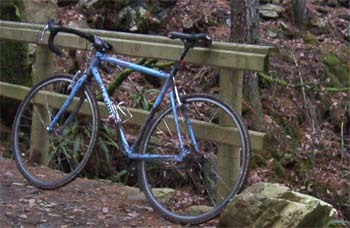 The Marin is so constructed that first couple of miles include the bulk of the loop's climbing, much of it on enclosed fire-track. It's not a rewarding experience. Somewhere near the top, I began to question the wisdom of being here in the first place. This was no place for a jumped-up road bike. Once past the top, things change quickly. The trail gives up its first bit of height without any drama, but then suddenly veers hard right onto the first stretch of singletrack proper. We're descending now, not too steeply, lots of sweeping S-bends. This is the first real taster of what's to come. Did I say 'taster'? On my rigid fixed wheel CX bike, I feel like I'm tucking into the main course. I'm surviving, but it's taking a fair bit of concentration. Still, everything's going to plan. There's even the odd bit of 'flow' going on. But a couple of steeper corners are making me feel abused. I'm being thrown into the corners where the bike wants to go, rather than the way I'd choose if I were freewheeling and concentrating solely on my line. I'm spinning furiously, doing my best to keep up as the back wheel skips over dry rock. At times it feels like both wheels have left the ground, the front thrown up by whatever obstacle it has hit and the back following on, partially locked. Then it happens - my Paris-Roubaix moment - I'm gritting my teeth from the effort of it all, arms shaking around, cheeks off the back of the saddle, the line is dragging me along, the legs semi-detached. They're doing their thing, pedalling, because they have to. The rest of my body is doing its thing, riding, staying aboard, steering, shifting, having fun. I'm on some sort of slot car race track. I know roughly what I need to do, but don't have quite the control over how I get there that I'm used to. Of course, it all works out. As I put more of the circuit behind me, the mental balance of 'was this a good idea?' switches from a definite 'no', to a 'maybe' to a resounding 'yes!'. I complete my circuit in two hours or so, a bit slower than a geared MTB obviously, but not disgracefully so. The final descents are as fantastic as the designers plotted. I've had fun, I've probably learnt a bit more about riding a bike, which is a good thing when you've been messing with them for 30+ years. And I've explored a bit of the unknown. Not a proper adventure, let's not kid ourselves, but something a little bit special. That's a good thing. Steve Riley got back into fixing in 2004. 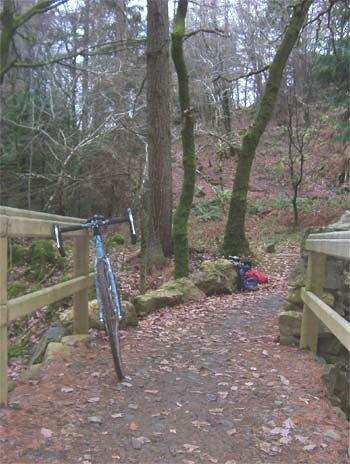 The Marin Trail is a man-made trail looping around the Gwydyr Forest above Betws y Coed in North Wales. It's about 16 miles long with around 1500 feet of climbing, much of it in the first miserable ascent. There's a map here, a more measured account here and a couple of videos here. Enjoy. Steve wrote for us last year about his new Pompino.